Manage application permissions using global and project roles. Global roles restrict general application features, whereas project roles restrict project-level capabilities. Administrator: An administrator can create new applications and projects, and view all the projects in their organization. They can also manage the users in their organization and customize the site content. Project Lead: A project lead has permission to create new applications and projects. User: A regular SD Elements user has permission to participate in projects. No Role: This role confers no permissions. You can select a global role to assign to new users. By default this value is the restricted User role. You may want to give users more permissive roles, such as Project Lead, or a custom role. Users automatically provisioned through Single Sign-On (SSO), such as SAML and LDAP, are granted the default global role. New users access the system and are granted permissions automatically based on this role. 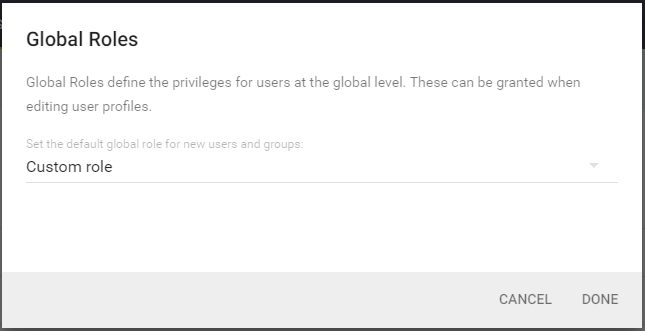 The user has the permission Global role→User Management→Manage users & groups. Open the Manage→Global Roles page. Click the edit mode_edit button on the top right. A dialog will appear. New users are assigned to the selected global role. An administrator can create custom project roles based on any combination of the permissions above. Read-Only: This user can view the project, but cannot make any changes. Normal: This user can view the project and change the project settings, change the status of tasks, and add notes. Manage Project: This user is the same as a normal user, with additional permissions to archive the project (close the project), change the project description, and add/remove/change users and their roles for the project. Name: This is the role name. Description: This is a short description of the role. Copy from: This copies the permissions from an existing role to get started, but is only valid for new roles. You can create or edit custom global and project roles to match your access needs. Open the Manage→Project Roles page. Click the plus add_circle button on the right. Fill in the fields described above. Select all the permissions you want to include with your role. When a role is created it can be assigned to users or groups. Permission updates take effect immediately. You can delete your custom global and project roles. However, you cannot delete the default roles because the application depends on them. Use search if you need to find the role. Hover your mouse over the row on the far right and select the trash can icon. A dialog will appear. 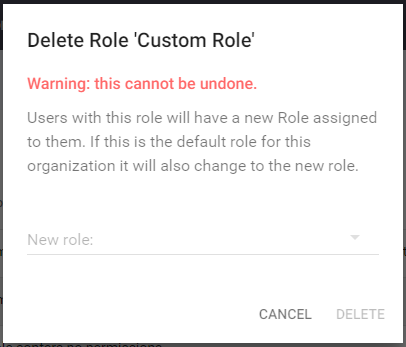 Select a role to assign to any users/groups that are currently assigned to the role you are removing. The role is deleted immediately. Affected users and groups are assigned to its replacement.